Since May 2015, all except two of Burgess Hill’s elected representatives, at Town, District and County levels, are Conservatives — and one of those is an independent who was elected as a Conservative. 1. 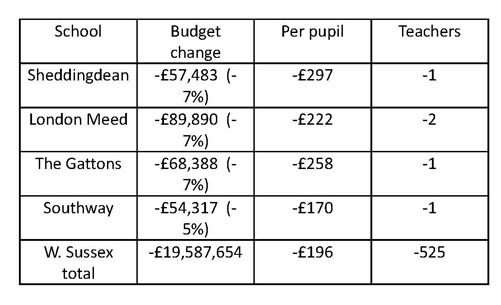 Education – cuts all round but money for grammar schools? 2. New River retail development – where are the toilets? Disabled people speak out. 3. Social care – continuing cuts leave the elderly vulnerable. Our local authorities must be held to account. We need a voice and representation that understands the real needs and concerns of local people. At the next County Council elections in May 2017, this area will be part of Burgess Hill North Division. Labour would provide that voice. And yet years of austerity mean that West Sussex schools are already at breaking point, with classes of 36+ and 4½ day weeks talked about. Meanwhile, funding is available for a new system of grammar schools that will benefit a mere 20% of our children. We need a properly-funded education system for all, not grammar schools for a privileged few. With the imminent closure of Central Sussex College in Haywards Heath due to high debts and “the significant savings to be had from reducing the number of campuses” (Sarah Wright, Central Sussex CEO), 16-19-year-olds will now have to incur heavy transport costs to travel outside Mid Sussex for their sixth form education leading to more limited opportunities for 16 year olds. This is the result of a Tory strategy of moving as many services as possible into the private sector. Education should never be run according to a principle of profit. And the Council have made little effort to step in or to instigate a thorough investigation into exactly what went wrong. In 2010, WSCC made a formal proposal to close two Special Schools at Newick House and Court Meadow and replace them with a new single-site special school for 3-19-year-olds on the Oakmeeds campus at Burgess Hill. Only part of the new school was built, with promises to complete the rest when funding was available. This left post-14 education at the old Newick House site with dilapidated facilities wholly inadequate for their needs. Oakmeeds has since become an Academy and WSCC have leased the whole of the campus to the Academy Trust, including the site allocated for the building to complete Woodlands Mead School. This was done without making any provision for their replacement building. 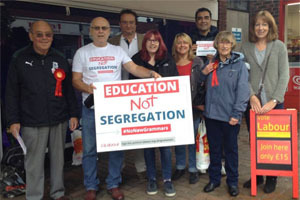 WSCC officers have repeatedly cited a lack of funds but at a packed meeting earlier in the year at which parents and staff clashed with West Sussex County councillors, it became apparent that these latter had little idea of what was going on and that the Council’s future planning was again at fault. Investment to revitalise our town centre is welcomed by Burgess Hill Labour Party but the District Council has shown little desire to hold the developers, New River Retail, to account. Following the disastrous decision not to replace the Martlets Hall, Burgess Hill’s only purpose-built entertainments centre, it now emerges that not only will there be no public toilet facilities in the town centre (with shoppers expected to use the facilities provided in local coffee shops and restaurants), there will also be no provision whatsoever for disabled residents. Imagine having to change your severely disabled child on a dirty floor, or in the back of a car. Imagine not being able to access normal toilets because you are a wheelchair user. For many this is a daily reality and makes everyday life a struggle. In the worst case scenario, it can leave people feeling isolated and unable to leave the house for fear they will be caught short. The District Council, meanwhile, has turned a deaf ear, despite the many suggestions and proposals being made by local disability campaigners to overcome this problem. That means that 81% of requests were denied social care last year. This was despite more people needing help because of an ageing population. This is unacceptable and the council must be held to account. More than 150 new members have joined Burgess Hill Labour Party since the General Election. At the General Election, Labour came second in Mid Sussex making us the main opposition to the Conservatives in this area. We are grateful for the support of so many of our residents and we continue to fight for a better Burgess Hill and for a fairer society. Jeremy Corbyn has promised a more democratic Labour Party. Policies to be put before the electorate at the next General Election will be decided by Labour members rather than just being handed down from the leadership. There will be more discussion and decisions by local branches and a system of electronic voting to allow for one member one vote decisions. WHY NOT JOIN THE LABOUR PARTY AND HAVE YOUR VOICE HEARD ON ISSUES THAT CONCERN YOU WITH A CHANCE TO INFLUENCE POLICY? We have regular branch meetings once a month, campaign in the town centre and a good programme of social activities.